The College offers two shuttle service lines: the Gold Line and the White Line. 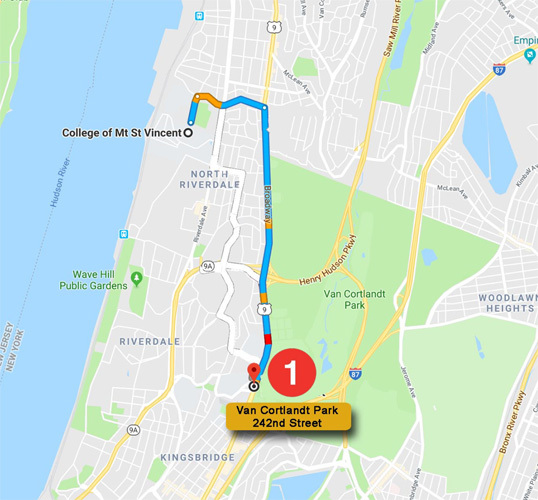 The Gold Line runs between campus and the Van Cortlandt Park–242nd Street Subway Station serving 1 train riders. 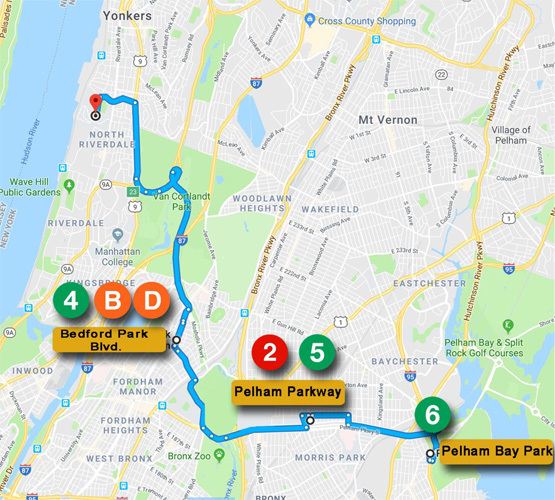 The White Line runs between campus, Pelham Bay Park, Pelham Parkway, and Bedford Park Blvd., serving 2, 4, 5, 6, B, and D train riders, as well as Bx10, Bx12, Bx26, Bx28, Bx38, and BxM11 bus riders. The shuttles leave the Mount from the east side of Cardinal Hayes Auditorium/Grace Center and run during the fall and spring semesters only. Both shuttles are accessible with a Mount ID and are free for all Mount Saint Vincent students, faculty, and staff. *On Fridays, the last shuttle bus on the Gold Line leaves the campus at 6:00 p.m. and discharges passengers at 242 Street at 6:30 p.m. The shuttle buses do not operate on Saturdays or Sundays. 2 and 5 trains Bedford Park Blvd. N/A 6:45 a.m. 7:00 a.m. 7:20 a.m.
8:05 a.m. 9:05 a.m. 9:20 a.m. 9:40 a.m.
10:25 a.m. 11:00 a.m. 11:15 a.m. 11:30 a.m.
5:00 p.m. 5:20 p.m. 5:40 p.m. 6:00 p.m.
7:00 p.m. 7:20 p.m. 7:40 p.m. 8:00 p.m. Questions, comments, and suggestions should be sent to operations@mountsaintvincent.edu.